We keep reminding ourselves that it is our National game and we have slipped so badly that the teams are always struggling. I have never heard or still could not pronounce properly - Mönchengladbach, formerly known as München Gladbach, a city in North Rhine-Westphalia, Germany. It is located west of the Rhine half way between Düsseldorf and the Dutch border. We are reading it today because of a success for the Indians – the hockey team – the women – Juniors in particular. The Hockey Junior World Cup, is an international field hockey competition organised by the International Hockey Federation (FIH). The tournament was started in 1979. Since 1985 it has been held every four years. Competitors must be under the age of 21 as of December 31 in the year before the tournament is held. There is also a corresponding event for the women's junior teams. This competition started in 1989 and uses the same format as the men's event. 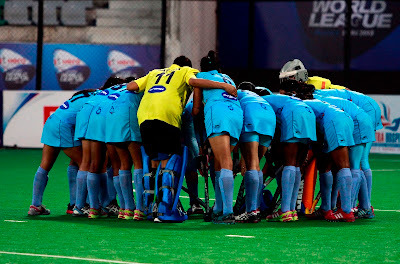 The happy news it that Indian girls created history by winning country’s first ever bronze medal in the junior women hockey World Cup as they pipped England 3-2 penalties, riding on striker Rani’s dazzling show yesterday. 18-year-old Rani scored India’s only goal in the regulation time and then found the net twice in the penalty shoot-out to script India’s memorable victory. India had surprised top teams in the competition and they finished their campaign in superb manner. England girls could consider themselves unlucky as they were pipped in the bronze medal match by South Korea in the last edition of the championship in Boston. The star of the show for India was goalkeeper Bigan Soy, who hadn't played even for a minute in the tournament prior to this game. With the result at 1-1 after 70 minutes of action, India replaced their first choice goalkeeper Ningombam with Soy. In the shootout, where only 5 out of the 14 penalties were converted, Soy saved five attempts from the English women as India escaped with a 3-2 margin on penalties. Rani kept her nerve to score twice while Navneet Kaur struck the winning goal. This victory in Germany is the first-ever world cup medal for women in any FIH world event. The men's side had won gold in 1975 (Kuala Lumpur), silver in 1973 (Amstelveen, Holland) and bronze in 1971 (Barcelona, Spain). In Germany, the reigning champions from the Netherlands defended their title at the ERGO Hockey Junior World Cup. The Dutch girls won the final against Argentina 4-2 in the shoot-out clinching the trophy for a record third time in women’s Junior World Cup history. The breathtaking final was tied 1-1 after regulation time and went into shoot-outs to decide the winner. India claimed their first-ever medal when winning the Bronze medal match against England. The final ranking sees all five continents being represented in the Top 8 which underlines the inclusivity and global popularity of hockey. Spain walked away with a narrow 1-0 win against Australia in the 5th place play-off match. 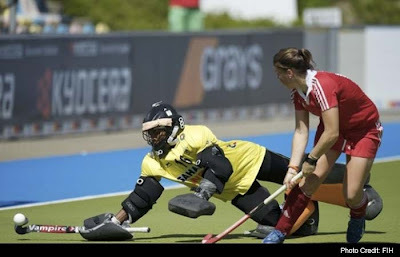 The Bronze medal match started off with an early penalty corner to England but Grace Balsdon’s shot was deflected before reaching India’s goalkeeper Chanu Sanarik Ningombam. The English girls kept pushing for the opening goal but it were India who would get on the scoreboard first. A counter-attack saw Rani powerfully strike home after 13 minutes of play. A few minutes later, India failed to double their lead from a penalty corner variation. The Indian girls slowly took control of the match, but were unable to break the English defence. The halftime score stood at 1-0. As the result remained tied 1-1 after 70 minutes of play, the Bronze medal match was decided in a penalty shoot-out competition. India substituted their goalkeepers replacing Ningombam by Bigan Soy who has not played a single minute in this tournament….. was it a flashy strategy or forced by circumstances … a substitute for the dying minutes of the game and that too somebody who had not played in the tournament at all… Certainly a great moment for us to celebrate. Earlier, Hockey India contributed Rs. 10 lakhs to the Prime Minister’s National Relief Fund to help the flood victims of Uttarakhand. Its Secretary was quoted as saying ~ “It’s a small gesture to help the state during this calamity. Hockey India is committed to making any similar contribution in the future also, whenever it is needed for the cause of humanity,” he added. I am not making any comparisons though !!! after that you will absolutely obtain good knowledge. this I've found It absolutely helpful and it has helped me out loads. If you wish for to increase your knowledge only keep visiting this site and be updated with the most up-to-date news update posted here. Here is my web page ... "bed and breakfast association"